Consolidated Edison’s fourth-quarter net income increased 144% to $505 million ($1.63/share) from $207 million ($0.68/share) in 2016, the company said last week. Total revenue for the quarter increased 9.38% to $2.961 billion. The company reported 2017 net income of $1.525 billion ($4.97/share), compared with $1.245 million ($4.15/ share) in 2016. Total revenue was down slightly in 2017 but remained above $12 billion. 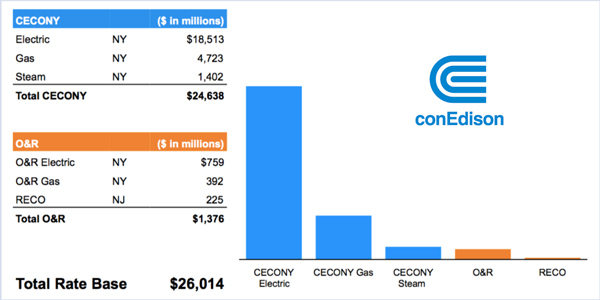 Con Ed said its adjusted earnings for 2017 excluded the remeasurement of deferred tax assets and liabilities upon enactment of the federal Tax Cuts and Jobs Act, the effects of the gain on the sale of a solar electric production project, and the net mark-to-market of Con Edison’s clean energy businesses. The company’s earnings presentation showed the new law reduced the net deferred tax liabilities for its Con Ed of New York, Orange and Rockland Utilities and Rockland Electric subsidiaries by more than $5 billion collectively. Con Ed plans to meet its 2018 capital requirements through internally generated funds and the issuance of securities. The company’s plans include issuing between $1.3 billion and $1.8 billion of long-term debt at its utilities and additional debt secured by its renewable electric production projects. The company also plans to issue up to $450 million of common equity in addition to equity under its dividend reinvestment, employee stock purchase and long-term incentive plans. The plans do not reflect the provision to utility customers of any tax law benefits that may be required by the New York Public Service Commission or the New Jersey Board of Public Utilities. Consolidated Edison’s third-quarter earnings fell 8% to $457 million ($1.48/share), a drop the company attributed to changes in its rate plan and regulatory charges. Consolidated Edison on Thursday reported 2015 net income of $1.19 billion compared with $1.09 billion in 2014.